Similar to a gougères recipe or a pão de queijo recipe (Brazilian cheese puffs), this Gruyère Cheese Puff Recipe is based on a simple choux pastry recipe, which uses flour, eggs, water, and butter. 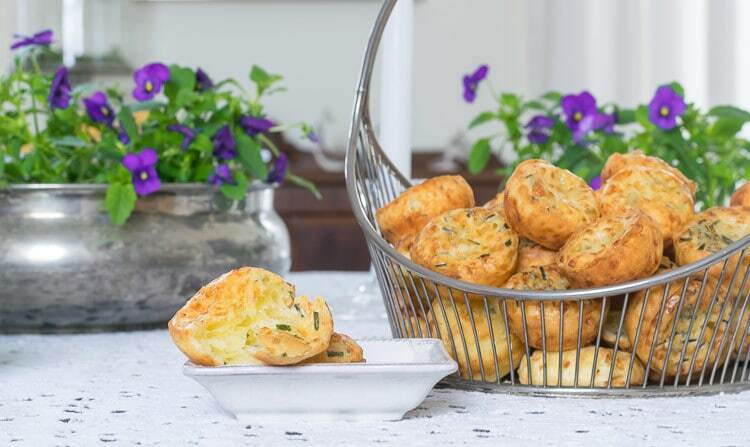 Substituting tapioca flour for wheat flour results in a gluten-free choux pastry (which is essentially what the Brazilian cheese puffs are), which is then elevated with the addition of Gruyère cheese and chives for this delightful and easy to make Gluten-Free Cheese Puffs Recipe. Oh, and did I mention Cheese! Very versatile…add your favorite cheeses, herbs and spices to make them yours. And while I am planning to serve these cheese puffs for an upcoming brunch, we also enjoy them on the side of big bowl of soup or as a cheesy appetizer with a glass of wine…they are equal opportunity cheese puffs! As an aside, did you see the recent study which claims that people who eat cheese live longer? That's all I needed to hear to justify my cheese consumption. One of the attributes of these Gruyere Cheese Puffs that my family likes is that they are a tad crunchy on the outside, but pull apart moist on the inside. I borrow heavily from the recipe on the Bob's Red Mill Tapioca Flour bag, substituting gruyere for cheddar cheese and adding chives for a little something extra. These easy to make, gluten-free cheese puffs are a staple on our brunch table, alongside a bowl of soup or as a cheesy appetizer with a glass of wine. 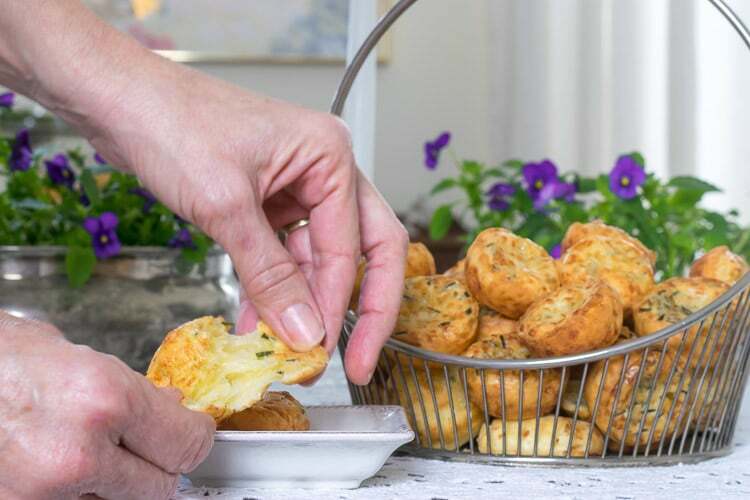 Made with Gruyere Cheese and Chives, this cheese puffs recipe will quickly become a favorite in your home as well. Pour batter into muffin tins, filling tins just over halfway. Bake for approximately 15-20 minutes, until lightly browned. Sprinkle cooked and crumbled sausage, bacon or ham over the puffs while in the muffin tin, before they go into the oven. Can You Make Cheese Puffs Ahead of Time? Absolutely. You can make up the batter and keep it in your refrigerator for up to a week, pouring out just what you need to bake. Alternately, you can go ahead and grease your muffin tins and fill them with the batter, freezing the whole muffin tray. Then, when it's time to bake bring your muffin tin out and let it come to room temperature while your oven preheats, baking per the instructions in the recipe card. Can you Freeze Cheese Puffs? You could either freeze the puffs in the muffin tin, as mentioned above or bake them fully and then freeze them, warming them in the oven before serving. But, to be completely honest, these little cheesy puffs are best right out of the oven. Please do! Make these your own by substituting your favorite cheese. I find that the harder cheeses do better, but the possibilities are endless. Swap out chives for your favorite herbs or spices as well. Sprinkle a little cooked and crumbled sausage or chopped ham over the batter once they are in the muffin tins. Bookmark this page or pin the following image to reference back to this cheese puff recipe in the future.